The Bombing of Saskatchewan August 26, 2015 · 18 min. readThis article may contain affiliate links. Two-hundred forty-three people currently live in Stony Rapids, Saskatchewan, which is exactly the same number of words in the whole Wikipedia article about the community. Stony Rapids is so isolated that it doesn't even have a road connecting it to the rest of the province. In fact, the only way to enter it is by private aircraft, so it would seem strange that the events in this hamlet would involve a continental-wide search and destroy mission that would bring World War II to the heart of the Canadian Prairies. 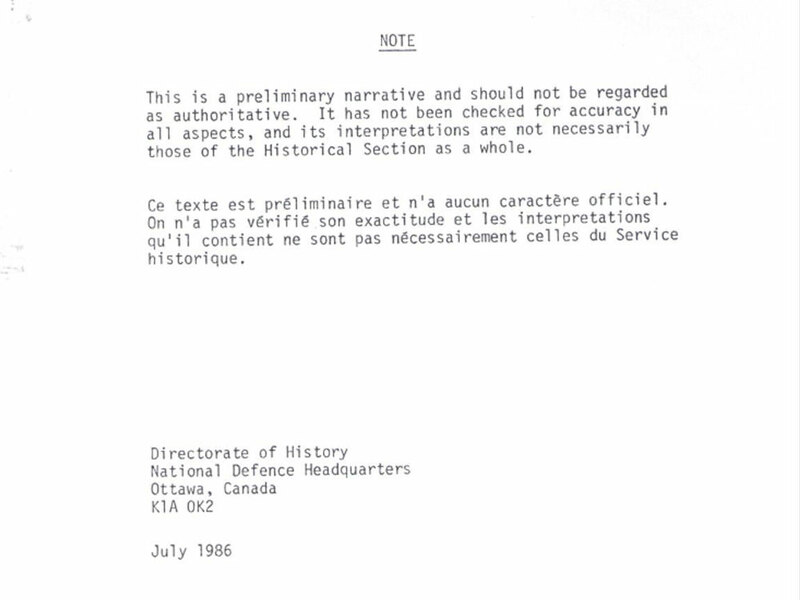 Details of the events in Stony Rapids are minimal, with several news agencies calling the Canadian military records "maddeningly brief". Fortunately, the events in Stony Rapids had several precursors, and by the time the people of Stony Rapids saw something in the sky above them, the military already knew what it was. The first recorded sighting was on December 4th, 1944 in Thermopolis, Wyoming. Two men were standing outside on that crisp night and heard a strange hissing sound coming from above them in the distance. Looking up, they witnessed a large explosion and a "white disk" floating away from the area. The men couldn't see what had happened where the explosion occurred, so they jumped into their truck and chased the disk. Within ten minutes they lost it in the darkness, so they returned to where the explosion was. There, they found a small crater and metallic shrapnel. This was the remains of one of the 10,000 balloon bombs launched by the Japanese to turn the tide of war against America. It was also the first ever intercontinental weapon. Using pre-War knowledge of the Gulf Stream, the Japanese built sophisticated balloons with sandbags and hydrogen releasing valves to retaliate against the Americans for the Doolittle Raid – the first bombings the Americans committed against Japan. It is believed that since many of the men were at war during the construction of these bombs, the government had children create them during after school hours. The balloons were 32 feet in diameter and held 19,000 cubic feet of hydrogen. At the bottom of the balloon were the bombs, which varied in size and weight during their development. The purpose of these bombs was to set the forest-fires along the Western Coast ablaze, and draw forces back to America and away from Japanese shores. To make sure the balloons arrived in America, the Japanese launched them from November, 1944, to April, 1945, when the wind was at its strongest. However, it was winter in North America, so the piles of snow and dead trees made the incineration of the forest extremely difficult. This the first mistake the Japanese made. The second mistake was that the Japanese used inefficient antifreeze in their balloons. Each balloon is controlled by a battery, and that battery is wrapped in plastic and surrounded by antifreeze, keeping the battery usable even at 30,000 feet. Because the antifreeze was so weak however, the batteries would freeze and the balloons would plummet into the Pacific Ocean, along with their explosive cargo. Torn paper shreds were found along the coastlines of Hawaii and California long before the bombs were spotted over Wyoming, but nobody knew what they were. Of the 10,000 bombs, it is believed only 10%, or 1,000 bombs, made it to North America. 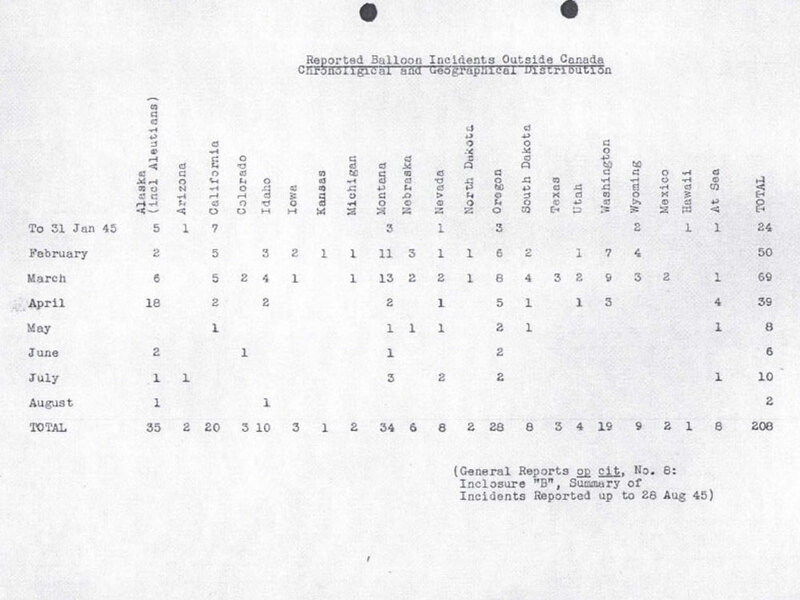 Of those 1,000, only a quarter have documented sightings. The bombs first came to the attention of the military two weeks after the Wyoming bombing, with the discovery of a balloon in the forest near Kalispell, Montana. The hiker who found it saw Japanese writing on the balloon, and contacted the FBI. The FBI then told the Army, Navy and Air Force, and a project was put into place to intercept and destroy these balloons. While the two bombs discovered so far were primarily fire-based, an idea took root that these bombs might very well carry biological pathogens, such as the B-encephalitis or Japanese encephalitis, a mosquito born virus that has an 80% mortality rate. (This was the same virus I had to be vaccinated from before entering Japan last year.) The Japanese had already used biological warfare on the Chinese with devastating results, so it wasn't out of the question that they would do it again. Another possibility was that the bombs held anthrax, and could be used to poison water reservoirs, crops and livestock. Farmers were told to watch their crops for unusual diseases and report anything if found, and military personal often wore protective equipment when approaching the bombsites. Any witnesses were told to keep quiet about what they saw. It was decided on January 4th to issue a continental wide media blackout regarding the balloons. Newspapers, radio and television programs were not allowed to report on them for the sake of national security. Cooperation was unanimous, and as reports of sightings became more frequent, the people remained unaware. This was done so that fear wouldn't sweep the nation and that that Japanese wouldn't increase their production. This worked, as Japan began their own propaganda program by reporting that both Canada and America were completely devastated by fires caused by the bombs. In reality, it is believed that only one actual report of the bombing made its way to Japan, and that it was of a dud found in Wyoming. Soon after the blackout, a joint military program was then put in place to intercept these balloons in an attempt to collect more data about them, but the balloons proved to be too small to be picked up on radar unless they are within 12 miles. 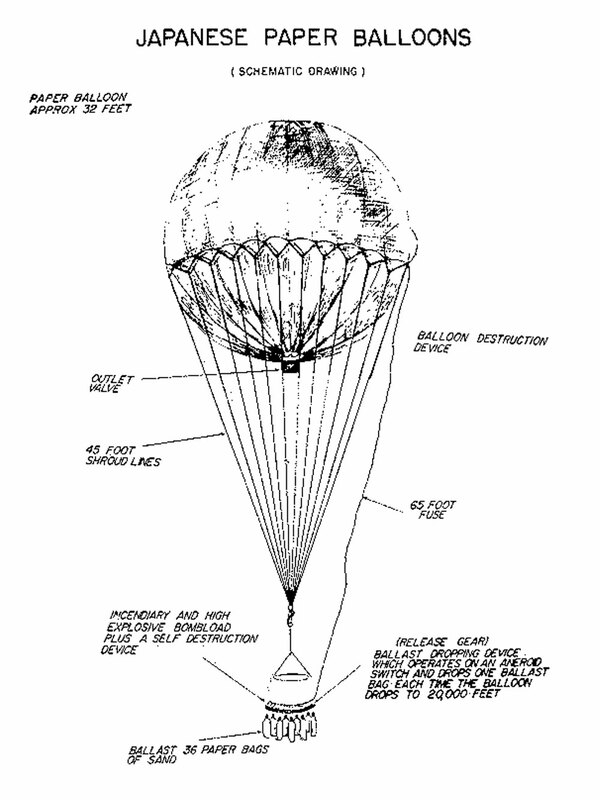 Additionally, the balloons traveled around 30,000 feet into the air, and conventional aircraft struggled to achieve that height, let along retain it. Thus, even if the military could find the balloons, they were regularly unable to capture them. Fighter jets were not only deployed along the West coast, but also in the Canadian Prairies, with five being in Saskatchewan alone. Of the thousands of balloons sighted, only 19 were ever shot down. Of these 19, 10 happened in a single day. For several weeks knowledge of how they balloons worked was a mystery. That changed January 12th, 1945. 11-year-old Tony Frischholz was walking down a gravel road in his hometown of Minton, Saskatchewan, when he looked up and saw a balloon heading towards the community. Not far away, 15-year-old Ralph Melle, his uncle and father from Regina were driving alongside the road and noticed the same balloon. They got out of their truck and followed it. Twice the balloon touched ground, and twice the balloon rebounded. During one of the landings, the balloon even dropped one of its bombs. Ralph discovered it after stepping on, but it failed to detonate. The balloon drifted out of site, so the trio reported it to the RCMP. They were able to locate it and found it caught on a barbwire fence, after having already plowed through two previous ones. They were then able to capture the balloon in relatively good condition, and took it to a nearby school to dismantle it. Their findings proved the bombs were fire-based and that they were set to self-destruct upon detonation. Therefore, there was no longer any reason to assume they might be carrying biological materials. The Minton bomb also helped identify the launch point of the 10,000 bombs. Geologists examined the sand grains used in the sandbags, and judged by the tiny marine fossils that it had originated from of Honshu, Japan's largest island. This dispelled fears that Japanese submarines were lurking off the Western coast, and that Japanese immigrants were launching them from their homes. Previous to the dissection of the Minton bomb, the idea that the bombs came from overseas seemed impractical. After the Minton bomb, it was the only logical explanation. Although the Minton bomb proved the balloons weren't as dangerous as originally thought, they were still very mischievous. On March 10th, one of the bombs struck a power line in Oregon and power was lost to a portion of the state. This included a plutonium reactor that was developing fuel for the Manhattan Project. The plant would remain shut down for three days before it was safe to turn back on. This delayed the testing, and ultimate deployment, of the atomic bomb. The father of the atomic bomb, J. Robert Oppenheimer, was even quoted saying: "Very shortly before the test of the first atomic bomb... I remember one morning when almost the whole project was out of doors staring at a bright object in the sky through glasses, binoculars, and whatever else they could find; and nearby Kirtland Field reported to us that they had no interceptors which had enabled them to come within range of the object. Our director of personnel was a man of some human wisdom; and he finally came to my office and asked whether we would stop trying to shoot down Venus." The news blackout continued until May 5th, 1945, and was only discontinued when a group of two adults and five children found a balloon while picnicking in a forest near Bly, Oregon. They attempted to drag the balloon out of the wooded areas to see it better, but it was accidently detonated and six of the people died. On May 22nd, the blackout was lifted and people realized what the balloons were. Lifting this blackout was crucial as there were several reports of children in Saskatchewan and Alberta that had found the bombs and were playing with their propellers, the paper parachutes and were disassembling the bombs out of interest. The lifting of the blackout brought an end to this as now the parents could contact the authorities if their children found anything remotely similar. 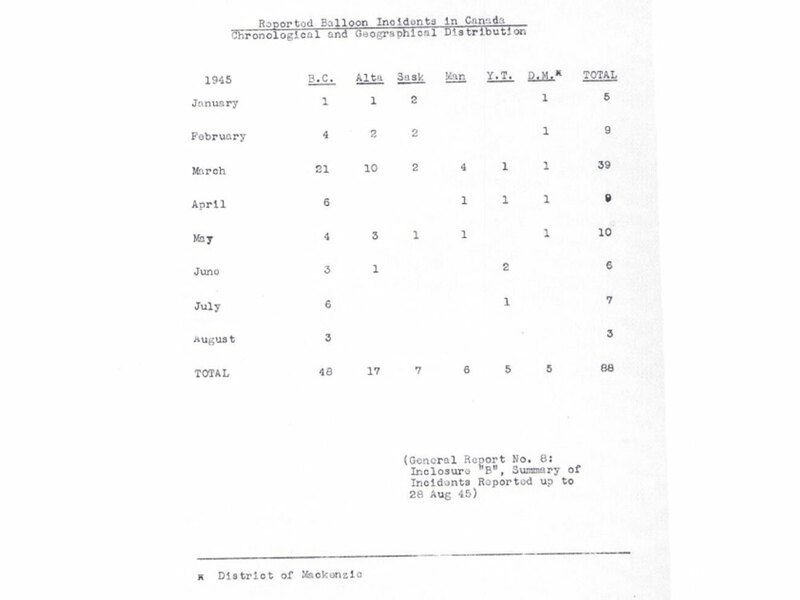 The deaths in Oregon were the only deaths to occur due to the bombs. On May 31st, the Toronto Start wrote an article on the bombs, claiming some were "filled with jelly-like substance now being analyzed in the belief that this matter is bacterial culture intended for the use against humans, crops or stock". The Canadian government saw this article as an abuse of the newspapers privileges and the Star was forced to delete it from their records, attempting to erase this false statement from history. The lifting of the blackout prompted the Japanese to respond in June, claiming another large-scale attack would soon commence, and that these bombs were the "prelude to something bigger". One possibility hinted was that the Japanese would send soldiers inside the balloons, deploying them across North America without warning. However, post-war records show a much more devastating plan scheduled for September – Operation Cherry Blossoms at Night – which was to unleash kamikaze fighter jets in southern California, and drop billions of fleas carrying diseases such as bubonic plague, cholera, smallpox, botulism, and anthrax, crippling the area and possibly the nation. The dropping of the atomic bomb and ultimate surrender of the Japanese in August prevented this from happened. The first possibility is that wind conditions proved to be too eradicate for precious bombings, with two reports of the balloons actually re-entering Japanese airspace and causing damage. A second possibility is that in March, the United States began napalm bombing Tokyo, unleashing a hurricane of fire onto the city and leaving over a million homeless. It would be reasonable to assume several factories of the bombs were destroyed. The third possibility is that the bombs' purpose had been fulfilled, at least according to the Japanese, and a next stage of the mission would begin by sending manned balloons. 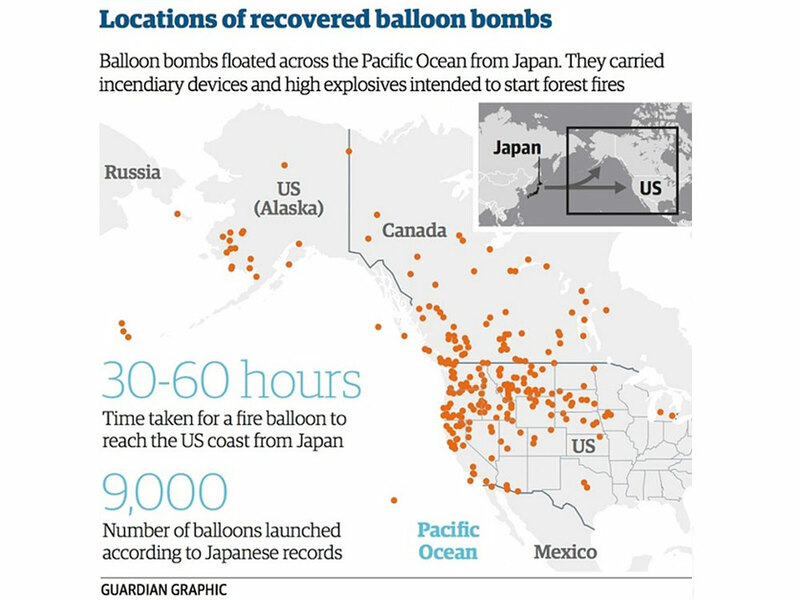 The last, and most likely possibility, is that the Japanese found the balloons were ineffective. A 10% arrival rate, with a 2 – 3% denotation rate, was not worth the resources spent on development and deployment. Of the estimated 1,000 bombs to have made it to North America, only 285 were ever found. The remaining 800 bombs are believed to be rusting and rotting in the forests of Canada and the United States. One bomb was found as recent as 2012 in British Columbia, and Canada's Department of National Defense was called in to destroy it. Prior to this, the last lethal bomb was discovered in 1955. Seen as the greatest kept secret of the Second World War, the bombs weren't as hazardous as they were originally believed to be. Instead, they were mostly considered to a nuisance, and only caused isolated physical damage. However, the bombs had the potential to cause serious psychological damage to the American public, since it had only been three years since the devastating attack at Pearl Harbor. Had it been public knowledge the Japanese were able to strike America anywhere at any time, panic would have swept the nation. Thankfully, the news blackout stopped this, and turned what may have been complete pandemonium into something much less serious. While the news blackout was lifted in 1945, the final report of the bombs wasn't published until 1949. It would remain classified until 1986, but with the influx of war documents released under the Freedom of Information Act, this incident was easily overlooked, and the memory of the day bombs fell on Saskatchewan would be forgotten by history. This article wouldn't have been possible without help from Kristian Peachey, the Assistant Curator of the Saskatchewan Military Museum. Please visit their Facebook page and give them a "like" to learn more about Saskatchewan's incredible military history. Nestled between the impressive Mount Royal and the majestic St. Lawrence River is Montreal, a city known for its festivals, abstract art, history and mosaic of countless cultures. Montreal is the second largest city in Canada, with a population floating around four million people. While the city is a dynamic mix of Canada's two primary cultures – French and English – there are areas of the city that are culturally specific, such as Little Italy, Greektown and Chinatown. Known for its artistic and liberal mindedness, Montreal also boasts the largest community of homosexuals in North America in their very own "Gay Village". Being nearly 375 years old, Montreal was pivotal to the creation of New France and Canada and at a time held control over every waterway from the St. Lawrence down to the Gulf of Mexico. Having such incredible influence over the western part of the New World, Montreal hosted the "Great Peace of Montreal" in 1701, which started sixteen years of peace between the French and over 40 different First Nation tribes in North America. Since its early days, Montreal has been one of the most influential cities in Canada. Montreal housed "internment camps" during World War I, became an ideal location for Americans looking for alcohol during Prohibition, and was the official residence of the Luxembourg royal family during World War II. Montreal held host to the incredible Expo 67, showcasing some of the most incredible architecture of that decade. The seventies saw serious political reformation in Montreal, with many Americans arriving, fleeing the Vietnam Draft. The late seventies paralyzed the city as a terrorist organization, the Front de libération du Québec, detonated explosives throughout the city and kidnapped and killed political figures. These actions forced the Prime Minster to enact the "War Measures Act" and deploy the military into the city to apprehend the terrorists. The eighties and nineties saw two referendums in the province of Quebec to separate from Canada, with Montreal playing a major role in both decisions. The last referendum in 1995 ended with 51% percent of Quebecers wanting to remain part of Canada and 49% wanting to separate. Imagine the bustling streets of New York, then times it by ten. Add a dash of Chinese culture, a wallop of nature and half dozen fish balls that don’t actually contain any fish, and you have the beautiful city that is Hong Kong. At 7.2 million people, Hong Kong is a dynamic city with an incredible history, towering skyscrapers and a unique mix of English and Chinese that can’t be found anywhere else in the world. While Hong Kong has existed for a millennium, it was officially founded in 1842 to solidify a truce between Great Britain and the Qing dynasty of China during the First Opium War. A decade after the British took control of Hong Kong, the Black Death swept into China, killing hundreds of thousands of people. It would remain part of Hong Kong’s life for a century. During World War II, Hong Kong was captured by the Japanese. For three years and eight months the British-Chinese culture of the city was destroyed, replaced with Japanese text, language and art. The booming city of 1.6 million people was slashed to only 600,000. Japanese occupation was incredibly harsh for the Hongkongese, being the darkest part of their history. Japan ceased occupation on August 6th, 1945, in response to the atomic bombing of Hiroshima and Nagasaki. For forty-two more years, Hong Kong was controlled by the British, with the reunification between Hong Kong and mainland China finally occurring in 1997. The past few weeks have been really busy for me, with a lot more time at the office and a lot less time travelling. Thankfully, the weekend is just around the corner and with it comes the possibility of a two day vacation. Having traveled to Lac La Ronge earlier this month, I've been thinking more and more about these short trips and how rejuvenating they can be. Unfortunately, I haven't done as much travelling around Saskatchewan as I'd like, so I wasn't sure what the best places to visit were. There were of course the obvious choices such as Regina, Saskatoon and Moose Jaw, but I wanted someplace remote, yet somewhat close. For this project I approached some of my fellow travel bloggers and I got some ideas of what to go do and see for a weekend. I went through their ideas and came up with this short list of 5 weekend destinations in Saskatchewan. Thanks to TELUS' incredible network, sections of Saskatchewan that once never had coverage can now be fully explored while still being connected to your mobile device. No matter where you travel in Saskatchewan -- or even in Canada -- this summer, you can rely on TELUS' mobile network to keep you connected.